1.Preheat oven to 425°. In large bowl, toss potatoes, onion, 1-1/2 tablespoons oil, caraway seeds, sage, salt and pepper; arrange in single layer on large rimmed baking pan. Bake 20 minutes. 2.In small bowl, stir mustard and 1/2 cup beer until well combined. Brush bratwurst with remaining 1/2 tablespoon oil. Push potato mixture to one side of pan; place sauerkraut on opposite side of pan. 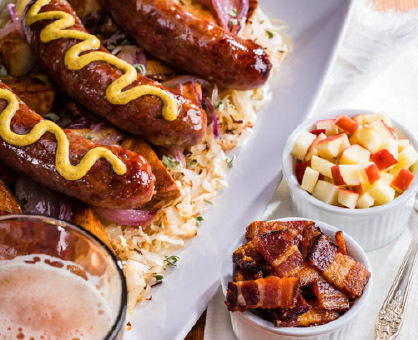 Place bratwurst on top of sauerkraut; pour remaining 1 cup beer over bratwurst and sauerkraut. Bake 25 minutes or until internal temperature of bratwurst reaches 160°. 3.Serve bratwurst drizzled with mustard mixture along with sauerkraut and potato mixture; garnish with apple and bacon, if desired.